This work belongs to the period of Popovic’s creativity when he found a link between dreams, imagination and reality in local landscapes, events and objects converted into symbols. This idea has been represented by other artists since 1950, like Lubarda. As a source of life in these works appear birds, rocks, fish hooks, walls. They have symbolic meaning, becoming symbols for different interpretations of the visible. The colouring comes to the fore, and the colour is what changes the structure of the whole picture. Large and dynamic moves further enliven the surface. The space seems to disappear and the whole painting gets two perspectives. Popovic gave his contribution to the associative methods of modern Serbian and Yugoslav art of the sixth decade through his cycle entitled Fog to the bones. 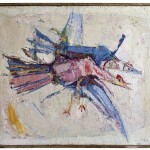 The importance of the artist and his work for Serbian and Yugoslav modern art is shown by the fact that the painting Birds / Cranes was purchased from the author in 1955 through the Office of the President of Republic. Mica Popovic was born on 12 June 1923 in Loznica. After the Second World War he enrolled the Academy of Fine Arts in Belgrade in 1946, in the class taught by Ivan Tabakovic. Together with Bata Mihajlovic, Petar Omcikus, Mileta Andrejevic, Ljubinka Jovanovic, Kosara Boksan, and Vera Bozickovic, he went to Zadar in 1947 and formed the famous “Zadar group”, the first artistic commune in the post-war Yugoslavia. After returning to Belgrade, they were forbidden to return to their university studies, as the authorities viewed the work of the Zadar group as subversive, but sometime later, they were all allowed to return except for Popovic, who continued to study on his own, with the help of Tabakovic. For his first solo exhibition in 1950 he published a personal manifesto. 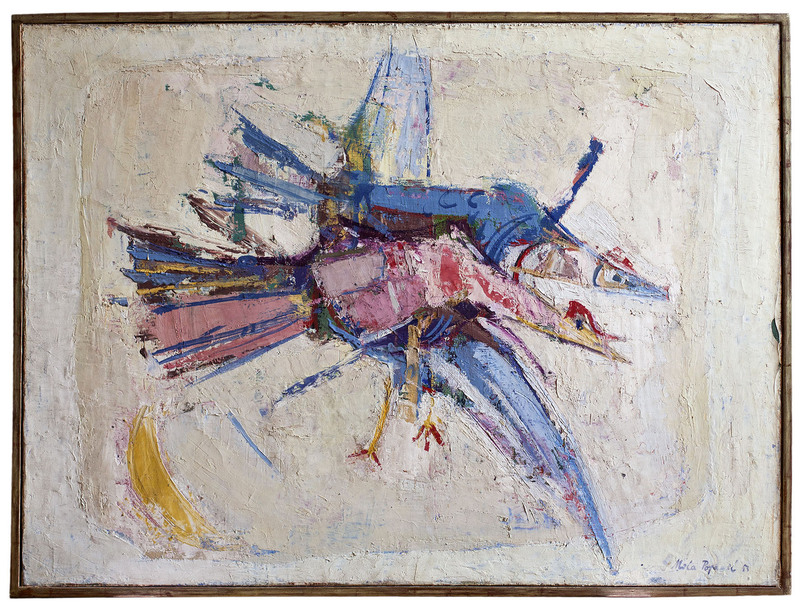 As a painter, Popovic is best known for his Informalism period (1958–1968) and his “Scene Paintings” from 1968. He was occupied by two elements – content, which transposes some of the current problems of modern man and form, which examines the nature of painting. In the period 1981−1983 Mica Popovic lived in New York where he taught painting. In 1956 he became a member of the art group Lada. In 1978, he became an associate member and then in 1984 a regular member of the SASA.